On Tuesday December 4, 2017 Michael Farmer, author of the award winning marketing business book Madison Avenue Manslaughter presented his Plan B for the industry to turn the manslaughter into a make over that would get brands and agencies moving again. 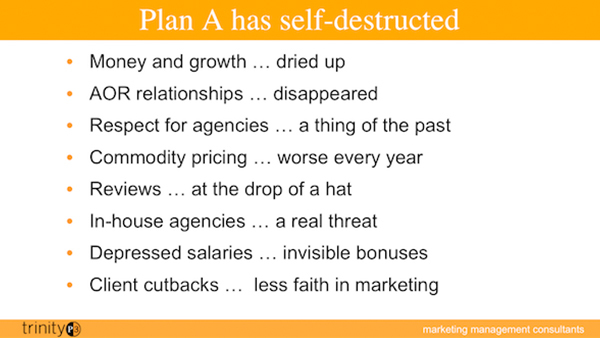 This is the transcript and video of the first of three parts of that presentation where he defines why the industry needs a Plan B. Before I start, just so that you understand, I’m a management consultant, not an Agency person. But for the last 25 years, I have been consulting to advertising agencies. And when I started in the U.K with Ogilvy U.K. I was asked, as a strategy consultant, to solve a problem they had, which was that they weren’t making any money shortly after being acquired by WPP. It’s not an unusual thing to be called in as a consultant in an industry that, as a rule, doesn’t understand what type of data you need to get into the business and understand it. And so, at the time I specified what I needed, and I’ll talk to you about that a little bit later. In order to understand the ad agency as a business operation–what is it that makes money sustainably over the long term? What type of relationships do you have to be in, in order to make money over the long term? What type of value do you have to deliver in order to be retained in a long-term relationship and make good money? Those are the types of questions that are analysable if the right data exists. Anyway, 25 years later, having worked on these problems for ad agencies, I’m convinced of a couple of things: ad agencies have been screwed and very badly over the last 25 years and some of it is their own fault. So, I wrote a book called Madison Avenue Manslaughter, which in a way traced my journey through an understanding of agency economics and how they’ve changed over the last 25 years. It’s led me to believe that today, more than ever, the industry and agencies in particular need a Plan B. And I’ll describe what Plan A is, which isn’t working, and what Plan B is that will restore economic and strategic health to agencies. This is just strictly based on the experience and the data that I have picked up working with ad agencies over the years. Now, I think you know what Plan B is. 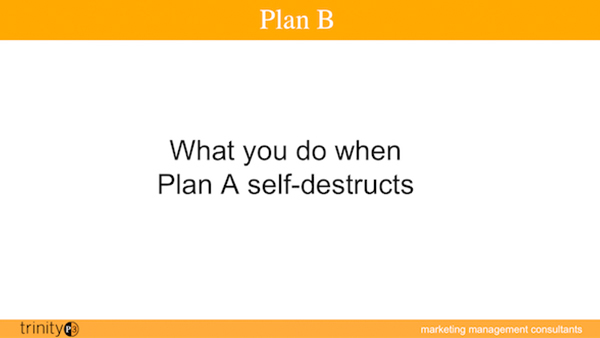 Plan B is what you do when Plan A self-destructs for whatever reason. 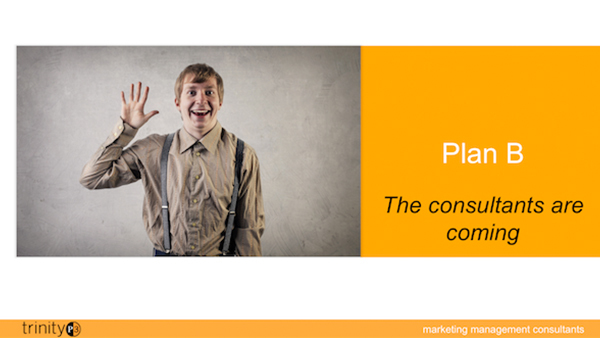 We don’t always have a Plan B when something comes up where we say, ‘time for Plan B’. I get a lot of this, living in New York, with bad weather, it happens all the time. 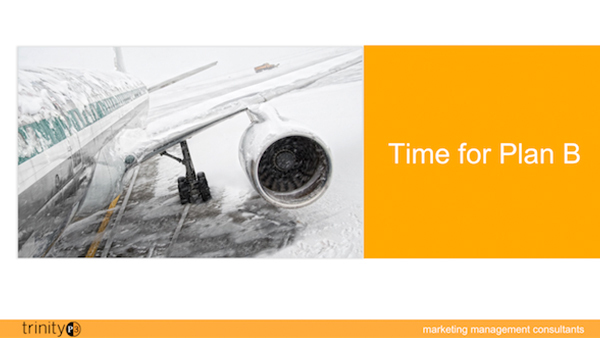 You’re planning a trip to Chicago or somewhere else and the planes are late because you’ve been snowed in—an important meeting with a client, it might involve some money, and you have to develop a new plan. Here it was supposed to be Plan B but sometimes Plan B isn’t good enough and we need a plan C. Sometimes Plan B is a lot worse than Plan A—I think you know what I mean. 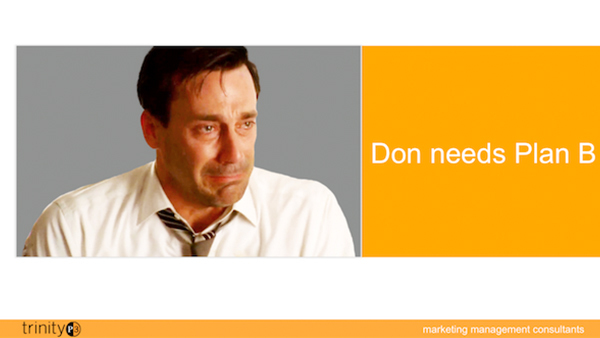 Don Draper needs a Plan B for the industry. If you all saw Mad Men, you understood that was filmed about a time when agencies were on commission; when television advertising was where all the money was being made, where creativity really drove brand sales, and the head of creative operations was the most important person in the agency. As much as agencies would like to believe that that is the culture that exists today, the economics don’t really favour it. The agencies are not being paid for it. If anything, their pay is going down every year and something else is needed but no one can really put their finger on it. And no one really talks about it very much and so we’re going to talk about that a bit today. 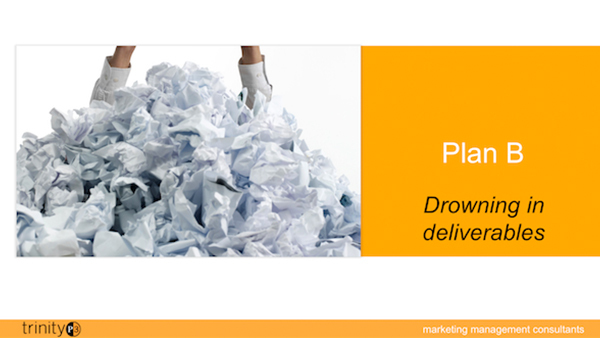 Plan B is required because ad agencies are drowning in deliverables. That’s one thing that has really happened. When I started analysing Ogilvy U.K. back in 1990; they did T.V, they did radio, and they did print, and it was the European headquarters for Ogilvy. They did a huge amount of origination work for very important clients like Ford, Unilever, and DHL, and others, and yet in a year they only did 360 briefs. That’s all they did. A few years ago, I measured them again and they were doing over 8,000 deliverables and they weren’t very much bigger in size. That’s because the business has shifted from TV, radio, and print to direct marketing, digital, and to social advertising. The volume of stuff they have to get out every day is of a completely different order of nature. So, agencies today are really massive production operations generating delivery after delivery after delivery in social and digital media, each one of them tiny. Each one tiny in terms of what it takes, in terms of creative and production time and client service and planning to get them out the door. 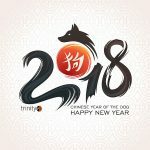 Nevertheless, having to be founded on good ideas, there’s not a lot of time to do the good ideas so this is a volume business and that is an important change that’s going on. And yet half of my career has been spent at the Boston Consulting Group and Bain and Company and so I know a little bit about how they operate. And I know that the consulting firms have grown at a rate that is astronomical. When I started with Bain in the 70s we were less than 100 people, and there are over 8,000 today around the world and the pay for the people that work there is more than double what agency people made and the bonuses are at a very high level. The billing rates are five times as high so it cannot be argued that consultancy firms are not creative in their own way. In their own way; it may be creative with spreadsheets or it may be creative with convincing clients that they are the answer to performance problems but whatever it is they’re being paid very well for their services. Holding companies are a very interesting phenomenon of the last 30 years. 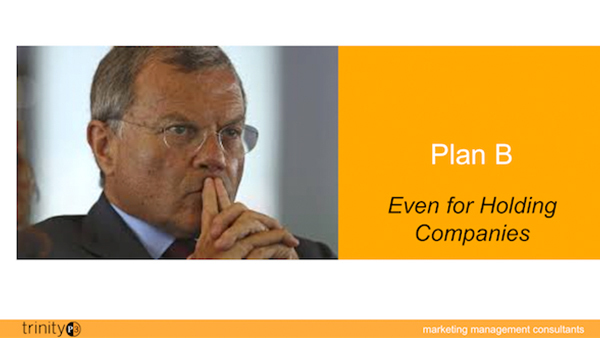 Although IPG has existed for much longer, when Martin Sorrell started WPP from scratch, he had the idea that you could buy, even on a hostile basis, big name agencies like JWT and Ogilvy who had a wonderful commercial franchise but were not well managed. And in fact, in 1986, when he bought J Walter Thompson at the height of commission remuneration, JWT was only making a 4% margin. Today, I will show you that agency remuneration has declined by two thirds since then and JWT has to crank out a 15 to 20% margin for Marcus Sorrell. So, the Holding company was based on the premise that you buy great companies that are under-managed and squeeze better performance out of them. That’s all they’ve done for 30 years. They have squeezed, through tight budgets, agency after agency and, of course, they acquire new agencies every year. But the whole deal about the Holding company is to establish tough budgets so that management has to squeeze surplus resources out. Now, you might argue that after 30 years there may not a lot left to squeeze, and that’s where we are today. And yet the holding companies do not have a Plan B. They are still squeezing the agencies who have had everything squeezed out of them, and the media companies who are now under enormous pressure from their clients over issues of transparency, and yet the holding company needs growth and profit improvement to hold up its share price. I’m writing this book, Madison Avenue Manslaughter; it’s sub-titled ‘An inside view of fee-cutting clients, profit-hungry owners, and declining ad agencies’. And what I have observed over the 25 years or so, is that clients are cutting fees and holding companies are squeezing the agencies for more performance, which leads the agencies to downsize, which reduces capabilities, which makes them less attractive partners, which leads to further fee cuts by clients—a doom loop. That is the case today. And yet the holding companies are continuing, if anything, in a more desperate play to get more performance out of the creative agencies because the media agencies are now falling on their face. Yet, you cannot lie to the marketplace. 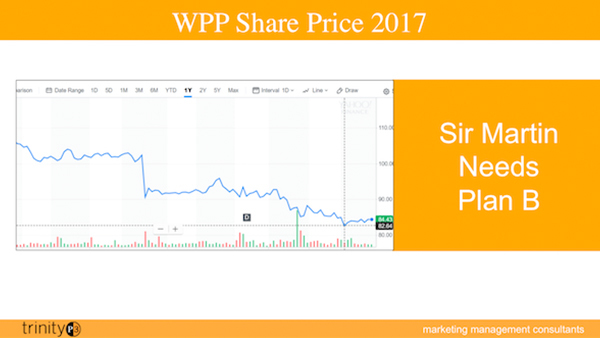 I don’t know if you can see this chart but this is WPP share performance this year. For the first time ever, the shares have gone down and they’ve dropped by 30% since February because the growth isn’t there, the profitability isn’t there, and there’s no expectation of it coming back because big clients like Unilever and Ford and others have said we’re cutting back on spend because we’re not getting the bang for the buck. So, if you have media agencies who are up against contract renegotiations and you have creative agencies that have no place to go and you’ve got clients that are cutting spend you’re going to have a decline in holding company shares. And at some point in the next couple of years, the analysts in the city and on Wall St and elsewhere are going to wonder if the parts are not worth more than the whole. That’s always what happens when big conglomerates fail to deliver performance. This is a very scary thing for WPP, IPG, Omnicom, Dentsu, Publicis, MDC and all the other holding companies because the only way they can really generate a growth in margin is partly to acquire (and there’s not an awful lot left to buy) and then to squeeze for more performance. And in 30 years down the road there’s not an awful lot left. I think in the next three years we’re going to see a major upheaval somewhere: a holding company whose argument is not going to hold together to Wall St.
I’m going to argue that Plan A, whatever that is, which is the basis for agency operations and the basis for making money has self-destructed. I don’t think many people say that. Certainly, agency people don’t want to say it because it’s a very upbeat, optimistic industry. It’s ‘we can do anything, deliver any type of service, craft any type of a problem, we can always be creative’ and that doesn’t sit very well with watching the fabric of an industry decline, for a variety of reasons, many of which are not within their control. But money and growth has dried up. I think we can agree that clients are not paying the kind of money that they used to pay, and that head counts are not growing. It’s very difficult to see any head growth in the industry. And when money and growth dry up you have to say there’s something fundamentally wrong with the infrastructure, with the business model. AOR relationships have largely disappeared in the last several years. If clients have gone out shopping for what they call best-in-class agencies to do search, social, digital, TV, direct marketing, CRM, PR and everything else they do, now that violates a basic principle of good procurement practices. Good procurement practices simplify the portfolio of suppliers and make them more intimate so that suppliers can work hand in glove with their clients to solve big performance problems. The automotive industry, aerospace industry and nearly every logistical industry has reduced the number of suppliers and made them intimate. This is the only industry I know where procurement has gone the other way and said, ‘the way to succeed is to have one of everything that’s good’. But the fallacy in that is that means that no one agency has any kind of a voice within the portfolio. In fact, I think it would be better to have an above average agency that could do everything, that would deliver much better performance than a portfolio of 30 best-in-class agencies, none of whom have a voice. So, there’s a big flaw in the disappearance of the AOR relationship. Partly, agencies brought it on themselves by being late to emigrating across media disciplines but, that said, procurement is going down the wrong path here. Respect for agencies; it’s kind of a thing of the past. 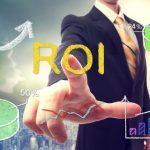 Clients think they are smarter, better, more experienced, and should be in the driver’s seat, and part of it is driven by the AOR relationship disappearing. So, who’s going to run the portfolio of 2,000 agencies or 50 or 20 agencies if not some person in the marketing department or marketing/procurement thinks that that’s their job? And it’s only a short step from that point to where the client starts taking full responsibility for the media plan, and the media mix, and the scope of work and its deliverables, and what agency gets briefed on what thing leaving agencies just standing there waiting to be told what to do. That is not the sign of a healthy relationship when agencies are waiting to be told what to do because the clients are making all the decisions. That is not a partnership. Commodity pricing—worse every year. I’m going to show you a lot about pricing, as I have analysed it in the industry. Now, pricing is not price per hour. It’s not overhead rate and it’s not profit margin. It’s not a benchmark. Pricing is what they pay you for what you’re doing and actually, since agencies don’t keep track of what they do and they don’t have a way of measuring it, there is no price for what you do. So, I’m going to have to show you how I arrived at that. In order to do my business, I had to know what the pricing was in the industry so we’ll take a look at it but it is now skating at commodity levels. I mean it’s just barely covering costs with a little bit for profit margin. And the costs that we’re talking about are for depressed salaries and almost non-existent bonuses so not terribly attractive. Reviews at the drop of a hat. When I started my business 25 years ago, agency relationships were somewhere between 7 and 15 years. They’re down to 2 to 3 years now. And to read in any of the trade magazines about who won what client is kind of silly because a client is not an annuity anymore, it’s a temporary stage. It’s a couple of years’ work before the CMO or a new CMO decides (because the previous one got fired) that a new agency is what the relationship requires. So, reviews at the drop of a hat; it’s serial dating. It’s not a marriage, it’s not a partnership. In-house agencies are a real threat and in a way the shift to digital and social has made this more possible because so much of the volume is low-value added. But, inevitably, as soon as they hire 10 to 20 people who want to work a 9 to 5 job and do re-sizing’s and email marketing, then they discover they need a pretty decent ex-head of an agency to run that internal operation and then that person gets ambitions, ‘well why can’t we do TV ads?’ It’s just like AOR. Then there is an inevitable pressure for the in-house agency to start to do everything and they have to hire people away from you before it all crumbles. But right now, we are in a period where this is very much the vogue. Everybody’s getting into it. They’re doing media plans, scope of work plans and more and more of the work, which takes the growth away, which creates even greater pricing pressures, so this is not a good thing. I don’t think it’s very smart either because I don’t think in-house agencies can bring anywhere near the depth of experience that you can bring. But it’s where things are going. Depressed salaries and invisible bonuses; we’ll talk a little about that a little later but there has been a big change in the level and quality of agency remuneration for its own people. So, there are client cutbacks in spend. We know that since about 2007 that major consumer brands have stopped growing. That took place about the same time as the world wide global financial crisis but it also took place shortly after Facebook was established and the market started to shift to social and digital advertising. So, you have big cutbacks in spend because of the crisis and then, when things came back, more of the spend was going into digital and social than in TV, radio, and print. It was also a time when the baby boomers gave way to the millennials in terms of which generation was the largest. It was also congruent with a time when ecommerce, as in Amazon, which you now have here, started taking over the distribution of a very wide range of products, which hurt brick and mortar retailing. So, many things happened at the same time: 2006, 2007, 2008 that we haven’t really recovered from. And neither Chief Marketing Officers nor their agency partners (or for that matter, the consulting firms) have figured out how to get brands moving again. And I think that Plan B, for all the people participating in the industry, will centre on who figures out how to get brands moving again for the Proctor and Gambles, Unilever, banks, insurance companies, the credit card companies and the rest. 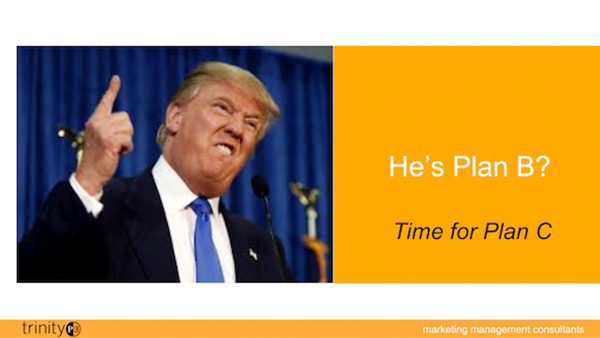 Marketing is very moribund right now and Chief Marketing Officers do not have a lot of credibility with their bosses. They do not have credibility because they are not delivering credible plans. They are not spending money wisely and they don’t have really good answers for why things are not moving. I think this last year was the first year that some of the big advertisers said, ‘the hell with it, I’m not going to spend anymore’. That’s what P&G did; they cut $140 million out of digital and social spending in one quarter and noted that it didn’t make the slightest difference. They were still not growing but they were spending less. So, now we have Martin Sorrell saying that the advertisers are doing something wrong by not investing in the business but not recognising that the agencies within the holding company’s portfolio are not actually contributing to the ideas that will help things to grow again. I think Plan B will be focused on who figures out how to get brands moving again in the world economy.